Almonds are a very nutritious snack, make sure to eat them unsalted though. This super-fruit is native to Central America with each avocado serving containing 20 minerals and vitamins. A Natural plant-based source of protein, mixed nuts can be purchased from a wide range of supermarkets or health shops. A protein boost mid-morning or mid-afternoon will help maintain a healthy blood sugar level. A handful can prevent overeating later on in the day. But don’t eat too much. During world War II, the cultivation of Kale in the was encouraged by the Dig for Victory campaign. Nowadays Kale has made a comeback and is rather trendy, but that’s no accident! Rich in nutrients which can reduce risk of several types of cancer, including breast, bladder, prostate, colon and ovary. Kale can help lower your cholesterol. Read more about the health benefits of kale here. Part of the cabbage family (all of which are healthy), broccoli has been shown to improve the functions of your respiratory and digestive systems. Three servings of broccoli a week (½ cup each) will support bone strength and good health. Any healthy diet requires protein, as well as fiber, fat and complex carbs. Lean meat is an excellent way to get in your fill of protein. Chicken, turkey and lean beef contain all the amino acids you need to build and sustain muscle. Have lean meat with one or two meals a day. This delicious fruit, like all berries, are rich in fiber which your body uses to run like a finely-tuned machine. Packed with vitamins for improved memory and immunity. Use a food blender to create a delicious fruit smoothie or simply add a handful to your oatmeal to add some magic! Although oil is essentially fat, Extra virgin olive oil is of the kind that is very good for you. Your brain and heart need healthy fats in order to function properly. Use olive oil as a salad dressing or cooking oil and you’ll begin to drastically improve your heart health. Forget milk-chocolate, if you have a sweet tooth, you can benefit from dark chocolate, so long as it’s just a small amount. Half a bar contains about 200 calories, 20 grams of fat and 10 grams of sugar. My particular favorite, the use of honey both as a food and also as a medicinal substance goes back at least to the ancient Egyptians. The main component of honey is natural sugar, water and sucrose. Honey contains nutrients including vitamins (B6, zinc, amino acids, and calcium), protein, pollen and minerals. This list of superfoods has been shown to have positive health benefits, so why not introduce them into your diet? Substitute sugar for honey and instead of process potato snacks and candy, exchange them for leafy greens, nuts and mixed berries. As you start to eat more of these anti aging superfoods and less processed foods, you will begin to feel the benefits of feeling more energetic, with a sharper mind and healthier body. 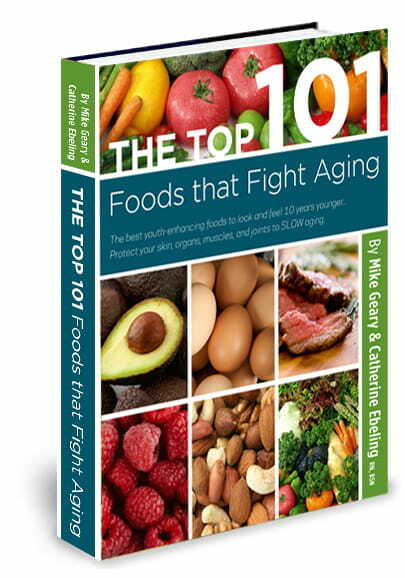 For more information and to discover more anti aging superfoods, check out The Top 101 Foods that FIGHT Aging here.